To get the latest updates you’ll need to refresh your browser. We hope you enjoyed following today’s events. Congratulations to France Arnold, Greg Winter and George Smith – worthy winners of the prize for the huge impact that their work has had on society. Look out for our feature on harnessing evolution in the lab that’ll be coming next week. That’s all for now, we’re signing off. Then we’ve got answers. Our explainer goes over why harnessing evolution in a test-tube took today’s chemistry Nobel prize, what it’s achieved so far and the great things it could still accomplish. “Huge congratulations to Professor Sir Gregory Winter on this well-deserved accolade! The pioneering breakthrough work by Sir Greg and his colleagues at the MRC Laboratory of Molecular Biology to develop humanised, and human, therapeutic antibodies has initiated a pharmaceutical revolution and led to the establishment of a whole new class of drugs which have helped millions of patients worldwide. Today, monoclonal antibodies account for a third of all new treatments, such as the arthritis drugs adalimumab and Humira, the multiple sclerosis drug Lemtrada and the breast cancer drug Herceptin. “It is fantastic that phage display has been recognised with a Nobel Prize, this technique revolutionised our ability to harness antibodies for the diagnosis and treatment of disease. “In phage display billions of individual molecules, such as antibodies, are displayed on the surface of small particles called phages. The molecules with desirable properties can then be singled out from the billions of others. The beauty of phage display is that the genetic information – the instruction manual for making that molecule of interest – is preserved on the phage particle so it can then be produced in much larger quantities. “At the end of the 19th century it was clear that biology could not advance without an understanding of its chemical basis. Starting perhaps with chromatography, chemistry began to provide the tools that allowed scientists to deconstruct the biological, but also a lot of parts of the physical, world that one might think of as ‘condensed matter’. In parallel with the growth of traditional chemistry was the rise of biochemistry and molecular biology, but also of geochemistry and lots of solid state physics, all of which came to rely on the methods and tools that were being developed by chemists. The result was that chemistry came to invade and become an integral part of the rest of science, including molecular biology and biochemistry. “People with chemistry degrees are everywhere from forensics labs to electrical engineering departments. All of those phrases like genomics, metabolomics and so involve the application and automation of highly refined chemical tools to attack higher order systems questions in other disciplines. “Greg has pioneered ways of obtaining human antibodies using bacteriophages so obviating the need for any immunisation of animals or humans to generate them. His technology has also enabled the generation of improvements in the binding power of any given antibody. 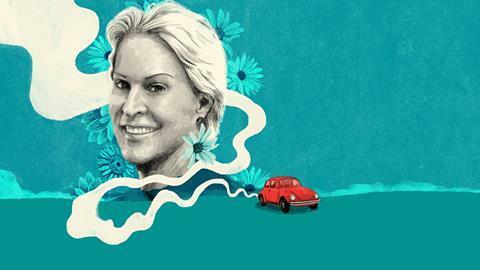 Nobel laureate Professor Frances Arnold recently spoke to the Royal Society of Chemistry about her research. She said: “Chemists are inspired and awed by the biological world but what they should really be inspired by is the process by which biology discovers chemistry: that’s called evolution. I practise evolution in the laboratory. We can evolve enzymes, these amazing catalysts that biology has, to do chemistry that was invented by humans, not by nature. “Today’s Nobel Prize in chemistry highlights the tremendous role of chemistry in contributing to many areas of our lives including pharmaceuticals, detergents, green catalysis and biofuels. It is a great advert for chemistry to have impact in so many areas. “Directed evolution of enzymes and antibody technology are subjects that I have followed with keen interest; both are now transforming medicine. It would have been hard to predict the outcome of this research at the start – this speaks to the need for basic research. 2.47pm What a place to work! The Nobel prize factory that is the MRC Laboratory of Molecular Biology in Cambridge in the UK continues its amazing record today. Greg Winter, one of today’s winners of the chemistry Nobel prize, did a postdoc at the lab and did some of the groundwork for his prize winning research there, later becoming deputy director of the institution. The LMB can now lay claim to nine chemistry Nobel laureates – more than most countries. Here’s the full list of laureates at the LMB, including a few physiology or medicine Nobel prize winners too! 1.54pm The first winner breaks cover! Caltech Professor Frances Arnold survived breast cancer, raised three boys after the deaths of their fathers (biochemical engineer Jay Bailey and astronomer Andrew Lange), and today won the Nobel Prize. Brace yourself for what is likely to be a very moving acceptance speech. @NobelPrize to @francesarnold and love her quote "I'm sure that there are people who are skeptical that a woman can do this job as well as a man," Arnold continued, adding, "I am blissfully unaware of such people — and have been gifted with the ability to ignore them completely. You can read our news story on the chemistry prize here and we’ll have an explainer article later today laying out just what this prize was given for. Chemistry World will also have a feature length article with interviews with the laureates and comment from leading scientists in the field of directed evolution early next week. We’ll be bringing you more reactions from the chemistry community during the day. And our news article digesting today’s prize will be coming out later today. One of Arnold’s most amazing recent pieces of work was evolving an enzyme that can create carbon–silicon bonds. Our feature on creating enzymes that overcome these biological catalysts’ fragility to harness their incredible speed and specificity has commentary from Frances Arnold on her directed evolution work. ’All of my favourite books are all about nature as a designer, evolution as a designer. They are all about the complexity of the biological world. By far, nature is the best chemist of all time.’ We talk Beetles and biotechnology with the newest chemistry laureate. Unfortunate problems with the line trying to speak to Frances Arnold. Let’s go to our next caller please! 10.52 We have our winners! Many congratulations to Frances H. Arnold who won one half of the prize for directed evolution of enzymes and to George P. Smith and Sir Gregory P. Winter who won the other half for the phage display of peptide and antibodies. The whole team is waiting now with cake. Nobel laureates tell us their favourite molecule from Chemistry World on Vimeo. 10.30am What’s it like to get the call from Sweden? Ever wonder what it feels like to win a Nobel prize? Chair of Chemistry World’s editorial board (just saying) and, of course, 2016 chemistry Nobel laureate Ben Feringa told us how it felt to get the call and find out he’d won the Nobel prize. 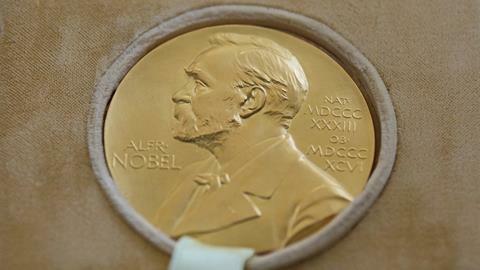 Is it time to abandon the Nobel Prize? Brian Keating says that the Nobels’ chequered history deserves a closer look. We’ll be talking to Brian in the November Chemistry World book club podcast about his new book, Losing the Nobel Prize: A Story of Cosmology, Ambition, and the Perils of Science’s Highest Honor. Clare Fiala and Eleftherios Diamandis also ask whether it’s time to look to other prizes that reward the collaborative nature of science, rather than prizes that create scientific superstars and perpetuate the idea of the ‘lone genius’ – an outdated figure in these days of scientific megaprojects. It’s been said before, but The Guardian’s science editor Robin McKie rounds up opinion from a venerable list of scientists who think that the Nobel prize is an anachronism in the 21st century. The scientists interviewed, including previous Nobel laureates, have a laundry list of complaints including that only a maximum of three people can win the prize and that it creates a misleading idea of how science works where collegiate collaboration is the order of the day. More on the age of winners of the Nobel prizes over the years (apologies for the potato quality of the figure). 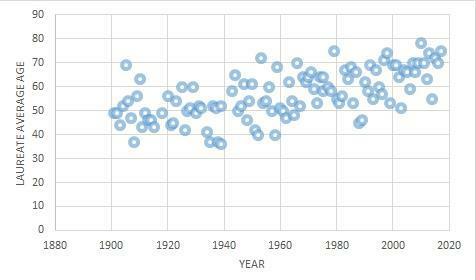 Looking at the average age of winners in each decade across all the prizes (the economics prize only got going in 1969). I believe the reason the average age of the peace prize laureates dropped so precipitously in this decade is down to Malala Yousafzai, who won the prize when she was just 17 for so publicly (and bravely) standing up to the Taliban and standing for female education in Afghanistan. It’s already pretty well known that very few women have a won a Nobel prize in the sciences (just four women have won the chemistry award in over 100 years – the first woman for 55 years won the physics prize yesterday). This Nature article looks at what the committee is changing in its secretive nominations process to tackle bias. 9.47am Do the Nobel prizes still matter? Top science writer Philip Ball asks what exactly are the Nobel prizes still good for these days? A thoughtful article with opinion from some very senior scientists including a few Nobel laureates. The web of connections between all the winners of the top prizes in the article is amazing and well worth a look. Over at Chemistry Views they’ve polled their readers on who they think will win the chemistry prize and come up with a few names, most of which won’t be a surprise to seasoned Nobel watchers. The most popular two choices were Polish-American chemist Krzysztof Matyjaszewski for the development of atom transfer radical polymerisation and Jordanian-American chemist Omar Yaghi for MOFs. Others with a strong showing include Steve Ley and Tobin Marks. Check out the entire breakdown – it’s fascinating to see the spread of predictions (the only thing nearly everyone agrees upon is that the laureates are likely to be men and from Europe or the Americas). Interesting tweet looking at the chemistry Nobels to see which fields have won over the years. Biochemistry is popular… anything to do with the people who sit on the committee? 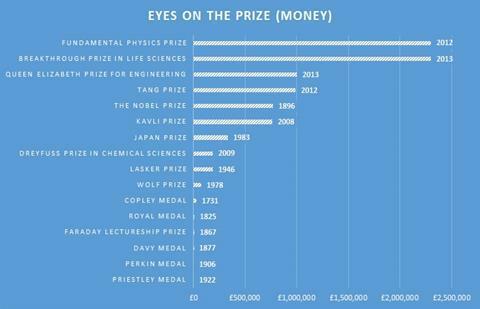 For the stattos and Nobel prize fans out there here’s a great page of facts and figures from the Nobel Foundation about the prizes. More data from the Nobel Foundation. 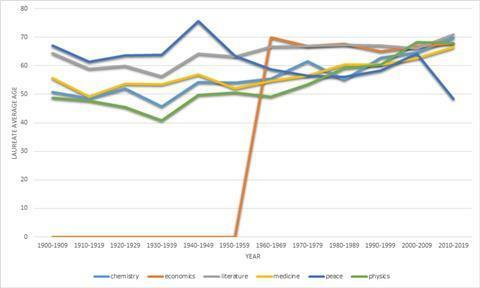 The average age of the chemistry laureates who have won the prize for every year since 1901. There’s a definite trend towards older laureates. Part of this is a change to the way the prize is run – the discovery no longer needs to be made in the previous year as originally stipulated in Alfred Nobel’s will. Although exactly when the Nobel committee started interpreting this rule more loosely isn’t clear. Just as there is day and night, yin and yang and cis and trans there are also the Ig Nobels. The irreverent counterparts to the Nobels recently had its award ceremony and answered many questions that no one has ever asked, such as are cats solid or liquid, can digeridoos treat snoring and why is cheese disgusting? Last year there was no chemistry prize, but this year the prize went for the discovery that spit and polish is an excellent cleaning solution for buffing up your antiques. The research that first makes you laugh and then makes you think is always worth a read. 9.25am How can I win a Nobel prize? The Chemistry World team have been chatting about why the Nobel prize has been so influential over the years and why it is seen as the premier science award. We decided that a big part of the reason the world has sat up and taken notice of the Nobels was cold, hard cash. When the prize was founded in 1896, winners could expect to receive around $40,000 – $1 million in today’s money. This made it by far and away the biggest award for any science prize. Other medals and awards may have a longer and more illustrious history when the Nobels came onto the scene, but they’re now the name everyone knows. Other recent prizes have recently been launched with even larger cash awards, but it remains to be seen whether they can capture the public imagination like the Nobel prizes have. 9.15am Wisdom of the crowd? Time for #chemnobel poll #2 (blame @ElisaTelisa) - if not batteries/MOFs/CRISPR, what’s most likely? 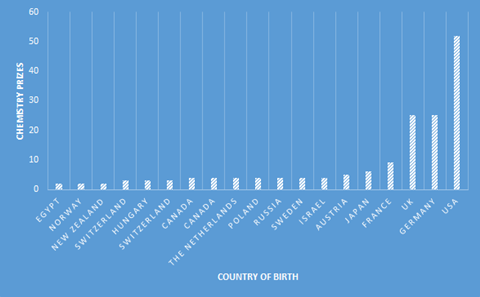 We’ve had a look at the data from the Nobel Prize site to see which countries the chemistry Nobel laureates were born in. 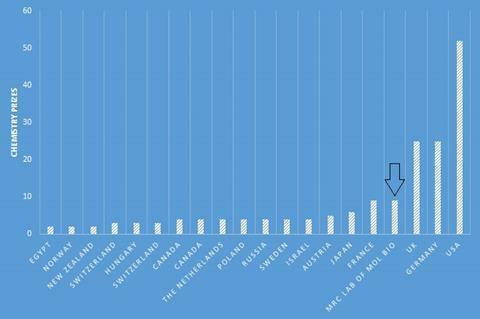 As you can see the US is deserving of it’s reputation as a scientific powerhouse with 52 chemistry laureates born there and many more moving to the country to do their most important work there. The figure only includes those countries that have two or more chemistry laureates that were born there. The other countries that have just one chemistry laureate are: Belgium, Bosnia and Herzegovina, China, Croatia, Czech Republic, Denmark, Finland, Italy, Latvia, Lithuania, Mexico, Slovenia, South Africa, South Korea, Taiwan and Turkey. Who and what will be taking chemistry’s top gong this year? John Goodenough and lithium–ion batteries? Henry Snaith and perovskite solar cells? Harry Gray and bioinorganic chemistry? Only a select few know but that hasn’t stopped people making the usual measured, sensible predictions – and some more off the wall suggestions. Check out our article on the predictions that people have been making. And if you have your own predictions then let us know below the line. Nobel nominations remain a secret for at least 50 years but you can dig into the archive here to see data up to 1966 for all Nobel prizes except the Nobel prize in physiology or medicine, which only contains data until 1953. Marie Curie won the Nobel prize in chemistry in 1911. She received two nominations that year, one of which came from Svante Arrhenius, who won the Nobel prize in chemistry in 1903. Alfred Werner received three nominations in 1911 – he went on the win the Nobel prize in chemistry in 1913. Lise Meitner received 48 Nobel nominations but never won a Nobel prize – few would disagree that she should have shared Otto Hahn’s Nobel prize in chemistry for the discovery of the fission of heavy nuclei. Otto Hahn received 39 Nobel nominations over the years. As a Nobel laureate, Hahn submitted 37 nominations. In 1948, Hahn nominated Lise Meitner and Otto Robert Frisch for the Nobel prize in physics (it went to Patrick Maynard Stuart Blackett for his development of the Wilson cloud chamber method, and his discoveries therewith in the fields of nuclear physics and cosmic radiation). Hahn nominated Klaus Clusius, a German physical chemist, 14 times for either the chemistry or physics prize (Clusius never won). In case you were wondering how many other people (or organisations) have won more than one Nobel prize, the answer is six altogether. Chemist’s chemist Linus Pauling won the chemistry and the peace prize, John Bardeen won the physics prize twice (1956 and 1972), Marie Curie won the physics prize in 1903 and chemistry prize in 1911 and Frederick Sanger won the chemistry prize twice (1958 and 1980) - first for his work on protein structure, and insulin in particular, and then for his DNA sequencing research, which launched the genomics era we find ourselves in now. Two organisations have won a Nobel prize more than once – the International Committee of the Red Cross won the peace prize three times (1917, 1944 and 1963) and the United Nations High Commission on Refugees won the peace prize twice (1954 and 1981). Obviously Sanger was a huge figure in the chemistry field and you can read about his life here. Sadly he passed away in 2013. As the excitement builds, let’s entertain ourselves with a few facts and figures on the chemistry Nobel prize from the award’s website, which is well worth a poke around on as it’s packed with interesting facts, figures and interviews. In all 109 chemistry prizes have been awarded since 1901 to 178 laureates. The prize wasn’t awarded in eight different years as no discoveries of sufficient magnitude were made (previously committees would only award Nobels for discoveries made that year, something that has now ended). The last time the Nobel prize committee decided against awarding the prize was 1942. Four women have won the chemistry prize (Marie Curie, Irene Joliot-Curie, Dorothy Crowfoot-Hodgkin and Ada Yonath). The average age of chemistry prize winners is 58 years old, with Frederic Joliot (Irene Joliot-Curie’s husband) the youngest winner at 35 years old and John Fenn the oldest at 85. The chemistry prize has gone to a single winner 59% of the time, although this has become less common in recent years. The press conference is expected to start at around 10.45am UK time (11.45am CET), barring any problems contacting the new Nobel laureates. We’ll be hosting the chemistry Nobel live feed here once it gets going and you can head over to the Nobel Foundation’s swanky new website to catch up with all things Nobel too. We’ll be tweeting from @ChemistryWorld all things Nobel prize related and recommend the #ChemNobel and #NobelPrize hashtag to keep up with what people are saying. Morning everyone, and thanks for joining us whatever time it is where you are. Excitement is building as we get closer to the announcement of the chemistry Nobel prize later this morning. Quick recap: we’ve already had two of the three Nobel science prizes – Monday was the medicine or physiology prize with a well-deserved prize for a revolutionary cancer therapy and yesterday was physics’ turn with lasers getting the nod in work that has given chemists tools to manipulate molecules and proteins with unprecedented dexterity. Yesterday also saw a female laureate – the first in physics for 55 years. The last female winner of the chemistry Nobel prize was Ada Yonath (check out this off-the-wall interview with her) in 2009 for her work elucidating how the ribosome works. One of the other winners Venki Ramakrishnan is now the head of the UK’s Royal Society. Chemistry is often a tricky field to make predictions that stick though… But stick with us this morning as the Chemistry World team will be live blogging the run up to the chemistry Nobel prize and of course after the announcement is made.